(RNTCP), ICTC Counselor, ICTC Lab Technician, STI Counsellor, Lab Technician (Blood Bank), Medical Officer under AFSC, Lady Counsellor, Technical Supervisor, Blood Bank, Account Assistants, DPMU posts. Total vacancies available in DHFWS Basirhat Health District Recruitment are 29 posts. Interested candidates can apply for these DHFWS vacancies using the recruitment link www.wbhealth.gov.in. Last date for submission of DHFWS Applications through post is 04-December-2017 before 05.00 PM. Application fee for unreserved candidates is Rs. 100/- and for reserved candidates is Rs. 50/-. For more information regarding District Health & Family Welfare Samiti DHFWS Basirhat Health District Recruitment Staff Nurse, Medical Officer, Lab Technician Vacancy details, application fee, Selection Process, Age limits, Application Procedure details are mentioned below. 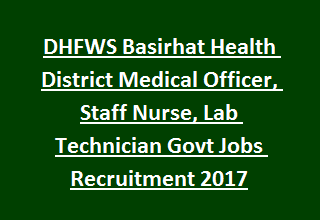 Total vacancies available in DHFWS Basirhat Health District Recruitment are 29 posts. Staff Nurse: GNM course from the Institute recognized by Indian Nursing Council and proficiency in local language. Medical Officer: MBBS Degree from MCI recognized Institute with one year internship (Compulsory). Must be registered under WB Medical Council. Lab Technician: Higher Secondary (10+2) from any recognized Board/ Institution with Chemistry, Physics, Biology/ Mathematics and Diploma in Medical Laboratory Technology. See the DHFWS notification for other posts qualification related information. Candidates will be selected for DHFWS Basirhat Recruitment will be based on higher qualification marks, written examination and interview. Application fee for reserved candidates is Rs. 50/- and for unreserved candidates is Rs. 100/- in form of Demand Draft. Application forms in prescribed format available at District Health & Family Welfare Samiti DHFWS official website www.wbhealth.gov.in. Select the desired post and submit the complete application with attested copies of Mark Sheets, Degree, Master Degree certificates in proper format through post before 04-December-2017 up to 05.00 PM.